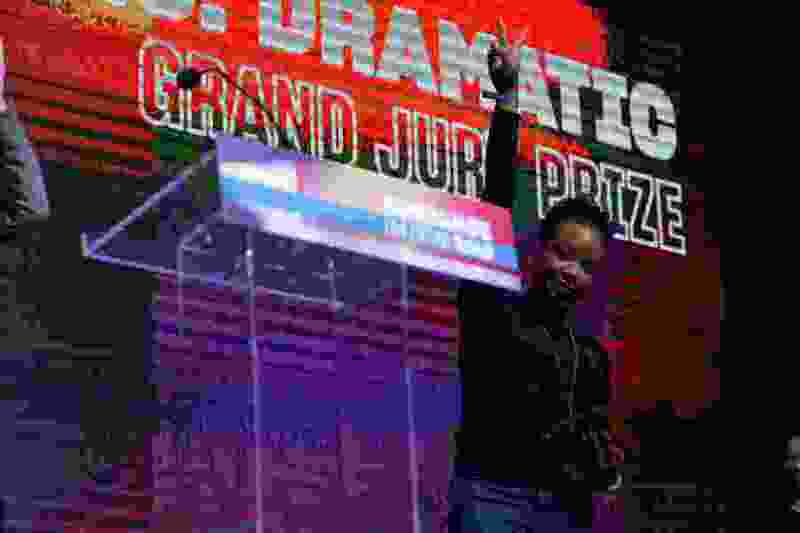 (Leah Hogsten | The Salt Lake Tribune) Director Chinonye Chukwu accepts the Sundance U.S. Grand Jury Prize for Drama for her film "Clemency" during the awards ceremony for the 2019 Sundance Film Festival at the Basin Fieldhouse in Park City, Feb. 2, 2019. More than 200 seminary and Christian college students, faculty and others who view films through the eyes of faith attended the Sundance Film Festival in Park City. Another award-winning film to explore religious themes was the short film “Ghosts of Sugar Land,” about a group of young Muslim-American men in Texas who think one of their friends has joined the Islamic State group. The film won the Short Film Jury Award for nonfiction. Priddy said that some students struggle with “dark and difficult” independent films shown at the festival. But he added that many Sundance offerings explore religious and theological themes in unexpected ways. For example, last year, a Sundance Grand Jury Prize was awarded to “The Miseducation of Cameron Post,” the story of a teenage girl whose sexual encounter with another girl leads her devout Christian aunt to send her off to a church-run gay conversion therapy center. Meanwhile, an audience prize was awarded to “Burden,” which was based on the true story of a Klansman who comes to faith and repents of his racism with the help of an African-American pastor. Priddy said the true stars of Windrider at Sundance are the members of the Park City faith community, who make the Forum possible in a small town of just over 8,000 people that can be overwhelmed by the annual film fest. Christian students who have participated in Windrider at Sundance come from a wide range of Christian schools: Dallas Theological Seminary, California Baptist University, Liberty University, Asbury University in Wilmore, Kentucky, Point Loma Nazarene University, Abilene Christian University, Ouachita Baptist University in Arkadelphia, Ark., and John Paul the Great Catholic University in Escondido, Calif. This year saw first-time students from New York University, Notre Dame, and Franciscan University of Steubenville, Ohio.